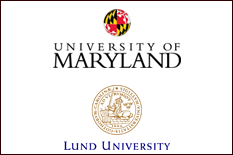 The University of Maryland (UMD) and Lund University (LU) in Sweden launched a new partnership to support scholars at both institutions to leverage research strengths, identify complementary areas of expertise, and explore potential collaborations that could lead to external funding. "The Gender and Care Responsibilities Over the Life Course"
"Meeting 21st Century Challenges in Structural Biology and Biophysics"
"Genomics of Biological Collapses and Invasions"
"National -to-Continental Forest Change and Crop Extent Monitoring Using Satellite Data Mass-Processing and Big Data Analysis"
Lund University has an international reputation for its diversity and strong environments for education, research and innovation. It is also the home of two major facilities for materials research: the MAX IV Laboratory that will be a world-leading synchrotron radiation laboratory and ESS, a European facility that will be home to the world’s most powerful neutron source. For more information, visit: http://www.lunduniversity.lu.se/.